Visiting Croatia? 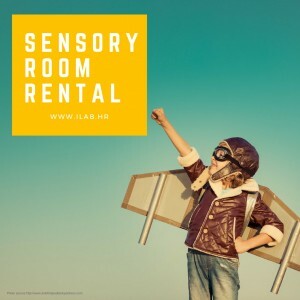 Rent a sensory room in Zagreb! you are planning to visit Zagreb but you are worried about how your children with sensory processing difficulties will cope with all the challenges around them? Did you find yourself needing to give your child some proprioceptive input or some extra vestibular stimulation, earmuffs, spinners etc? It is not easy – long walks, crowds, trams, exhausting journey, noise.. Your child can easily become overwhelmed and nervous following a hectic schedule so getting some calming sensory input can go a long way. Pun intended It can help your child stay regulated and enjoy your family trip. Because of all of these reasons and because we care about all the sensory kids out there, not just the ones in Croatia, iLab now made a sensory room available for rent! You can choose to spend some time with your child and help him or her to regulate sensory issues OR or you can work together with our English speaking SIAT therapist and staff. In both ways you will be asked to fill in the questionnaire about your child’s habits and sensory needs beforehand. Contact us at office@ilab.hr for more information and pricing, and follow us on Facebook and Instagram (new!). Posted on June 13, 2017 by Lina.